Jackson Academy, already known for its extensive use of technology in the classroom, has added even more opportunities for students to use technology in its new mobile broadcast trailer. 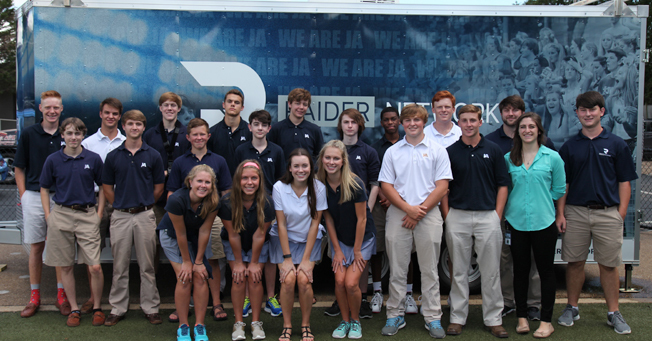 The Jackson Academy Raider Network, formally launched in 2015, broadcasts various athletic and extracurricular activities over the internet. Within a very short time period, the Raider Network has become a widely recognized high school broadcast production in the Southeast. Various organizations have solicited the Raider Network to produce their live events, such as the Mississippi Sports Hall of Fame, Shorter Productions, and the Mississippi Association of Independent Schools. 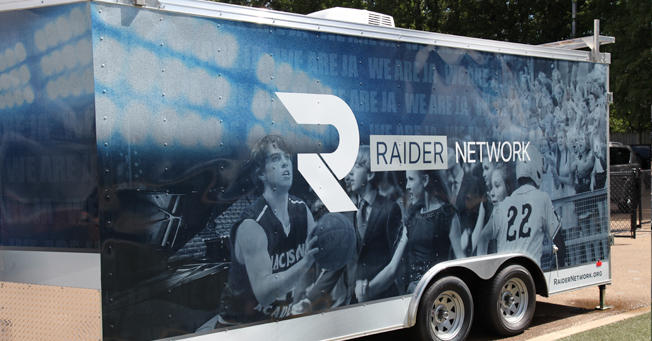 This month the Raider Network is launching a high-tech broadcast trailer that meets the requirements for ESPN3 broadcasts. This 18-foot production trailer houses a crew of five that produces, directs, and coordinates each event. The trailer utilizes the latest in high-definition broadcast equipment. This year the Raider Network will be able to produce events that require up to 10 cameras, multiple channels of replay, 32 channels of audio, and high-definition graphics packages. Jackson Academy staff, alumni, and students staff the Raider Network. The purpose of the network is to showcase the skills and talents of Jackson Academy students as well as to train students to use live production equipment. “As with any discipline you need the proper tools to perform the task at hand, but equipment doesn’t make television. People make television, and the Raider Network is in good hands,” Pray said. This year Jackson Academy will also launch a sports broadcasting class that will focus on producing events along with working with the new broadcast trailer. Students in the class will learn how to produce events based off training materials that the University of Mississippi uses to train those that are part of the ESPN SEC Network. According to Pray, there is always a need for individuals with live production experience and know-how. “I would encourage any students who are interested in a career in broadcasting to get involved with this team. It will prove to be an invaluable experience,” he said. For more information about the Raider Network, visit raidernetwork.org.